Our Google's SketchUp training videos will teach you how to work with this powerful tool. If you're new to building 3D models our Sketchup training course will help you get up and running in no time. The secret to SketchUp lies in the intuitive tools that work the way you think they should. Start today and redecorate your living room. Invent a new piece of furniture. or model your city for Google Earth. 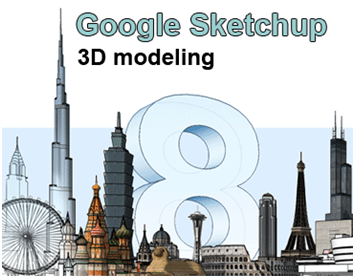 There's no limit to what you can create with our training Videos for Google SketchUp 3D. Wondering What Makes Google SketchUp so great? Edges and Faces: That's all there is to it. Every model is consists of edges and faces. Edges are straight lines, and faces are created from the edges of the 2D shapes that form a flat loop. An example is a rectangular face that is bound by four edges connected together at right angles. To build models, you draw edges and faces using a few simple tools that you can learn in a small amount of time. It's as easy as that. SketchUp's patented Push/Pull tool can extrude any flat surface into a three-dimensional form. All you need to do is click to start extruding. To stop, just move your mouse, and click again. You can Push/Pull a rectangle into a box. You can Push/Pull the outline of a staircase into 3D. Push/Pull a hole through your wall, and you have just made a window. This software is that easy to use. This tool is great for working fast in 3D, but since you're working on a computer, everything you create in SketchUp has a precise dimension. You can build models that are as accurate as you need them to be. You can print scaled views of your model, and with the Pro version, you can export your work into other programs such as AutoCAD and 3ds MAX. You use SketchUp's Follow Me tool to create 3D forms by extruding 2D surfaces along predetermined paths. Model a bent pipe by extruding a circle along an L-shaped line. Create a bottle by drawing half of its outline, then use the Follow Me tool to sweep it around a circle. You can even use Follow Me to round off (fillet) edges on things like handrails, furniture and electronic gadgets. You can use SketchUp's Paint Bucket tool to paint your model with materials like colors and textures. You can attach different parts of the geometry in your model to make Groups, create sub -objects that are easier to move, copy and hide. Components are similar to Groups, but with a handy twist: copies of Components are related together, so changes you make to one are automatically reflected in all the others. Windows, doors, trees, chairs and millions of other things benefit from this behavior. Learn about the powerful, real-time Shadow Engine that lets you perform accurate shade studies on your models. You can use the interactive Sections feature to temporarily cut away parts of your design, enabling you to look inside. Use Sections to create orthographic views (like floorplans), to export geometry to CAD programs using the Pro version, or just to get a better view of your model while you're working on it. Section Planes can be moved, rotated and even animated using the Scenes feature. Sketchup's Scenes allow you to easily save precise views of your model so you can come back to them later. If you need to create an animation, simply create a few Scenes and click a button. Presto! Your done. Learn to get inside of your model with a set of simple navigation tools designed to give you a first-person view. Click with Position Camera to "be standing" anywhere in your model. Use Look Around to turn your virtual head. Finally, switch to Walk to explore your creation on foot; you can even climb and descend stairs and ramps, as if you were playing a video game. You can use dimension and Label tools to add dimensions, annotations and other detail to your work. The Instructor dialog box provides context-sensitive help, and you can choose to activate at any time. SketchUp and Google Earth are part of the same product family, so you can exchange information between them easily. Need a building site for your project? Import a scaled aerial photograph, including topography, directly from Google Earth to SketchUp by clicking one button. Want to see your model in context in Google Earth? Click another button, and you can. Use this powerful software to build models which can be seen by anyone in Google Earth. The Sandbox tools let you create, optimize and alter 3D terrain. You can generate a smooth landscape from a set of imported contour lines, add berms and valleys for runoff, and create a building pad and driveway. The Google 3D Warehouse is a huge, online librar of 3D models which you can search through when you need something. Why build something when you can download it for free? You can import 3DS files directly into your models. If you already have something in 3DS format that you'd like to use, just import it in, and continue along. With SketchUp, you can import image files like JPGs, TIFFs, PNGs and PDFs. You can use them by themselves or you can add them to surfaces to create photo-realistic models of buildings, package designs, and more. You can export raster images up to 10,000 pixels square, so generating an image which you can send in an email, publish in a document, or project on a wall is as easy as choosing a few options and clicking Export.